On Nov 5, 2013, Michael Runge presented "An Overview of Lawrence County Spanish American War Memorials" to an audience of 62 people at the November Spearfish Area Historical Society meeting. Michael is an anthropology graduate from the University of Wisconsin and is currently the City Archivist for the City of Deadwood. There were four Spanish American War Memorials given to Lawrence County, two in Deadwood and two in Spearfish. The first to arrive was the bronze cannon placed in front of the old high school in Deadwood on July 8, 1899. It is still there although the school is now the elementary school. Investigating the history of the cannon, Michael Runge found the cannon's serial number and contacted the Spanish National Archives who handily responded. The cannon originated at the instruction of Queen Isabella II in a letter dated 1861, requesting its shipment to the Philippines. A year later, the cannon was built by the Royal Foundry in Seville and was shipped around the Horn of Africa and Cape of Good Hope to Manilla Bay. The Spanish American War began in 1898 when the Battleship USS Marine was sunk and on April 25 war was declared. By April 30, South Dakota had 1008 volunteers, with 62 from the Northern Hills. The war was quickly won and approximately 1200 cannons were captured. The mayor of Deadwood at the time was Sol Star and Sol and a group of businessmen requested a cannon to celebrate the 4th of July and also welcome home the First Regiment of SD Volunteers for the Spanish-American War. Although the cannon arrived late on July 6, on July 8, 1889, it was dedicated in a ceremony led by a citizen dressed as Uncle Sam. The second memorial to the war is a hollow cast white bronze statue currently located in Spearfish Park in front of the log building. In 1899, women from Spearfish organized to obtain a monument to honor two soldiers who had lost their lives in the Spanish American War. They raised money at community events in Lead, Deadwood and Spearfish. Phoebe Hearst was a major benefactor. On Oct 3, 1900, the statue was originally placed at Rose Hill Cemetery but it was later moved to the city park. In the spring of 1905 at the Spearfish Normal School under Fayette Cook, two Spanish American War cannons were requested and the graduating class put together funds to build a base and later place the cannons in front of Woodburn Hall. In 1942, the students under Dr. Jonas wanted to support the war effort and gave up the cannons for scrap metal. The last memorial is the smallest of the four, but the story brings us to modern times. 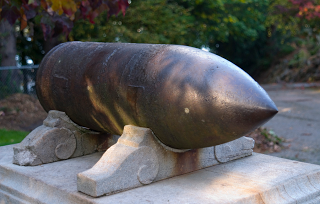 The memorial is a shell from the Battleship USS Maine sunk in Havana Harbor, Cuba. In 1912 it was salvaged and hauled to Key West. A year earlier, in Deadwood, the Sherman Street Fire burned an entire block, leaving space for a new park. The city requested a piece of the USS Maine, and received a 30 inch 500 lb. shell. Since the item was so small, it was originally discounted and placed with the bronze cannon at the old high school where it was forgotten for decades. In 2011, Michael Runge found it there, submerged in the dirt next to the cannon. They rolled the shell to City Hall while investigating further. Then the thought came "Was this a live shell?" and an investigation followed. The DCI bomb squad took an X-ray of the shell and found out that it could be a live shell with rear percussion detonation capability. Michael Runge called in Ellsworth AFB and their bomb squad responded within one hour. They took the shell to the rubble site and used 1.5 lbs of C4 explosive to detonate the back end of the shell, creating a quarter-size hole. 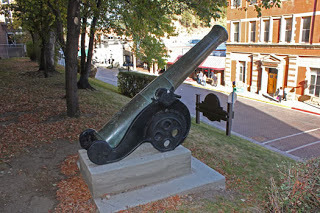 In 2012, the artillery shell was dedicated to its current located in Deadwood Park.